The time has finally come. In just 16 short weeks I’ll be running the Medina Half Marathon and working towards my mission of sub 2:00! I’m finally out of my non running funk and couldn’t be more excited to get some major mileage back on my shoes. Last year was the trial run of the race, and it went so well that I couldn’t wait to sign up for the race again this year. I’m more than confident that I can run sub 2:00, and without any injuries I should be able to ramp up training to push me to my limits. 2013 was a rough year of running for me, so this year, I’m determined not to let anything get in my way. So with out any more delay, let’s take a look at the facts for the race and see what the next 16 weeks will bring! The half marathon is capped at 1000 runners for the first year, and it just sold out last night. Amazing how many people will be running the streets of Medina on May 31st! There is a 5k option available with no limit of runners. It’s only $20 until April 1st, and you can sign up here. The medal is one of a kind and created by the same company that does Boston’s medal. If you can’t run the race, or happen to be in the area on race day, you can sign up to volunteer here! 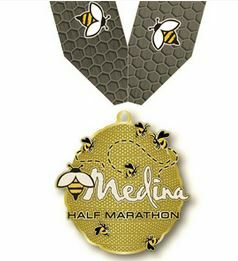 Medina Half has a race specific training plan you can follow if you’re looking for some help. There are also group runs and course runs available as well. All other info can be found here or on the Facebook Page. As you can tell, I’m excited for this race. I know the course and I know what to expect as far as hills and when I need to push it and when I can take it easy. As far as my own goals and training, I went back to Runner’s World Smart Coach to set the basics. From there I added my cross training ( Body Fusion & Yoga) and moved a few things around to where I’m comfortable. I’ve included speed work and hills again and this time I don’t completely hate them. I also included optional running days that help to keep me from running too much, but can help if a workout earlier in the week didn’t go as planned. As for my goals, I’ve got quite a few. I’ll need to keep all of these in mind if I want to have the best race of my life come May 31st. Run Sub 2:00. The giant milestone that I am currently 5 minutes and 56 seconds away from. PR. As long as I run 2:05:54 I’ll have a PR, but I’d love to have a pretty big gap between my next PR and my current one. Even better if it starts with a 1. Gain weight. Yes, such a troublesome topic that most people hate to talk about. I’m not happy with my current weight and know that I need to fill out a little. Let’s say add 10lbs, because we all know that 5lbs comes and goes easily. Cross train at least twice a week. Whether it be Body Fusion, Yoga or getting on the bike, I need to keep on this. I know that cross training helps to keep me injury free, so that should be motivation enough. Eat healthier. This goes alone with gaining weight. If you eat poorly, you run poorly. I also need to find the perfect foods for race day eve and race day morning. Tummy troubles no more. Raise $1000 for Team JDRF. As you may or may not know, Darren was diagnosed with Type 1 Diabetes when he was 3 years old. Diabetes is now a part of my life as I watch him live with it every day. Team JDRF is fighting to find a cure for Type 1 Diabetes so that future generations won’t have this horrible disease. Each week I’ll be posting a fact as way to educate readers on Diabetes. If you want to help find a cure, you can donate here. I truly appreciate it! So there we have it, the facts about Medina Half, my training plan and my goals for the next 16 weeks. It’s going to take a lot of work and dedication to reach this milestone, but I’m so excited and can’t wait for May 31st! B) You are going to ROCL the sub-2 half this year!!!! I can feel it!! !